Jamyang Kyi (‘jam dbyangs skyid) was detained by the Public Security Bureau in Xining on 1st April 2008. She was accused of sending text messages to 17 of her friends, including Woeser, the Tibetan blogger based in Beijing. The Chinese secret services intercepted text messages between them and found that Jamyang Kyi had sent details of the unrest and the killing of Tibetans in Ngaba (Amdo). Jamyang Kyi was released with a huge fine. Since her release she has been posting accounts of her experiences during her incarceration on her blog. We have translated one of her posts which was originally written in Tibetan titled “They” (Kho tshos) as well as comments from readers. Jamyang Kyi is one of the most well known figures that were detained in the aftermath of protests that swept across the Tibetan plateau in March 2008. She was born in 1965 in Jador Radza County in Amdo (Qinghai Province). Jamyang worked for 22 years as a news presenter and journalist at the Tibetan language section of Qinghai Provincial Television Station. She was a familiar face amongst the people in Amdo. Since 1990s, Jamyang Kyi devoted more time to her true passion that is music. She became a popular singer and has produced a CD titled Prayer and two VCDs, Distant Lover, Karma and her latest VCD, Fortunate Events (photo below). Even during her incarceration one of the interrogators confessed to liking her music. Jamyang Kyi other passion is writing. She has published two books, an anthology of poems and while in detention her book title “Mixture of Snow and Rain, Joy and Sorrow of Women”, (za mo’i skyid sdug gangs ma char) was published (photo below). 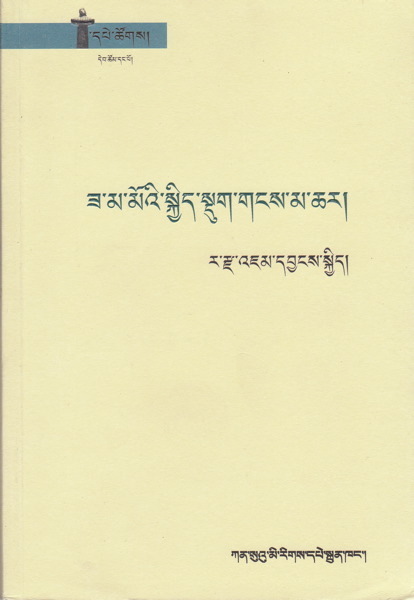 A lengthy review of the book in Tibetan by Trisem (Khri sems) can be found here. The book was published with a support of her friend Norzin Wangmo (Nor ‘dzin dbang mo), who was also arrested in April 2008. Last week Jamyang Kyi posted on her blog that Norzin Wangmo had been sentenced to five years imprisonment on 3rd November. 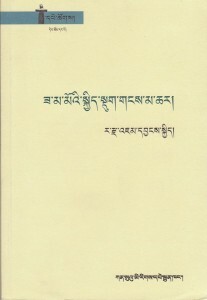 The book is the first feminist’s critique of Tibetan society and her writing is widely influenced by Western feminist writers. The book is filled with her observations of treatment of women in Tibetan society, where wives are treated no better than servants, who attend only to household chores. She questions why it is that while a monk enters a house, automatically a higher seat is offered but when a man enters a room even a nun has to give her seat for the man. She asks Tibetan women to question if they were just born to be “only housewives”. Jamyang Kyi’s concerns for the plight of Tibetan women and desire to fight injustice within a patriarchal Tibetan society lead her to write an expose of the trafficking of girls in Amdo (Qinghai Province) for the Tibetan language version of Qinghai Daily (30 November 2005). Her staunch feminist stance made her unpopular with conservative sections of Tibetan society. Jamgyang Kyi argues how can the Tibetans fight to justice when injustice is perpetrated in our own community in the name of tradition. In January 2008 a blog by Tsering Kyi, former Miss Tibet and accomplished writer who wrote a blog post in Tibetan hosted by mchod me (The Lamp) was shut down by the host because readers complained that pictures posted by Tsering Kyi showed her wearing “revealing western dress”. On January 7th, Jamyang Kyi’s blogpost defended Tsering Kyi and saw the erasing of her blog as the silencing of women’s voice. Jamyang Kyi wrote: “the truth is that our culture fosters the physical and mental abuse of women. Women are expected to be obedient housewives. Women are expected to remain silent and when they speak their mind, it is seen as a bad omen. Women spend their lives near the stove in a house that belongs to the brutal and egotistical man”. She wrote that women of Tibet needed to proclaim their voice in the society. Jamyang Kyi applauded Tsering Kyi for breaking the shackles of tradition. In one of her recent blogposts she wrote critically about the failure of Tibetans to modernise and reform during the first half of the 20th century, which generated interesting comments from her readers. Through her blog, books and music, she has become an influential figure amongst a younger generation of Tibetans, particularly amongst college-educated women for whom she has given a voice to their concerns and struggles. 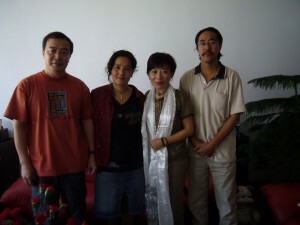 During her interrogations it became clear that one of the main charges against Jamyang Kyi was her friendship with Woeser and her husband Wang Lixiong (see photo below). Woeser and Jamyang Kyi are two of the most influential women in Tibet today and the friendship between the two women is based not only on their mutual intellectual curiosity but also on larger issues such as justice for the Tibetan people. In an account she has written of her incarceration, she writes how one of the Chinese female guards taunted her with racist and disparaging remarks about Tibetan people and the guard told her that her young child wants to see Tibetans killed. Jamyang Kyi recalls thinking, “You have the rights to speak of my people in these harsh words, where is my right to speak for my nationality?”. I see a lamp to clear the darkness of the Snowland. I am reminded of the compassionate mothers of the Plateau. I see the footprint of our ancestors in the mountains of the Plateau. You scattered the first seed of pride of Mother Snowland. You fulfilled the wishes of the mothers of the Plateau. If an opportunity comes where I can listen to these stories from you, I will never forget the story and sound from my ears. You are one of few brave Tibetan women. The courage, suffering, and endless intimidation you have endured cannot be forgotten by history and Tibet in general. You are the leader of Tibetan women. You are an angel of this age and an answer to embarrassing, useless Tibetan men who are drunk with arrogance. Your words of hardship and courage to stand in the face of fear is a song that is spreading in every corner of land of the snow and in the heart of every Tibetan. 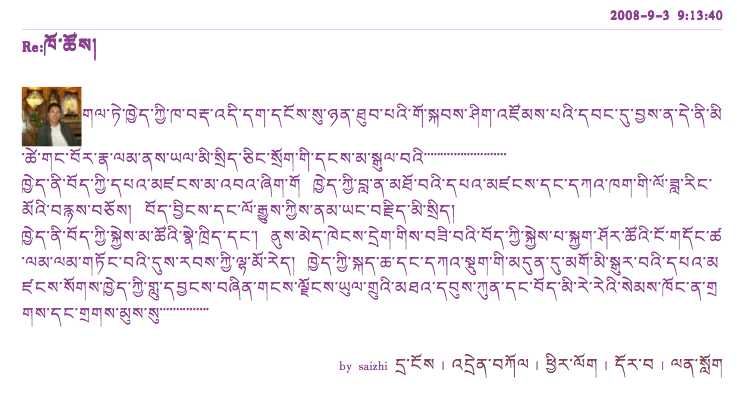 Someone called Adon on the blog talks at length about Tibetan women’s rights and so forth. I think, Adon is not a woman at all. The reason is that her thinking is not only strongly connected with religion. It is only in the enlightened realm where someone like Adon would live. Discussion about freedom and equality takes place among real people. And when he brings issues of god and religion into the conversation, [this] makes me think he is a monk. I am going to relate to you a dream. The dream comes from the experience of suffering and happiness. The dream comes from the tears and sadness. In the sleep of peaceful night. The dream comes from the beauty of light and moon. And it comes from karma and the lord of death. Dear friend. I have read your thoughts. All the best. The film “The Lives of Others”, on my blog I have titled it “Sneaking Storm”. Everyone, please search for it. It had to tatter with the years. Even if you give life to the wind. It is unclear if [i will] be released early. It is possible that even I can reach the shrine of freedom. These feelings and this pain are the remains of accumulation of past karma. Yet the struggle of [our] nationality and the truth is realised through tears and blood from each one of us. Oh Sister, with droplets from your pen, take us steadily forward. Sister Jamyang Kyi. My respect to you. I bow to you from the depth of my life. You are our pride, you are our courage. May your life be free from hindrance forever. Jamyang Kyi, I hope you are well. During your absence, all we could do was pray. You became someone that captured our thoughts this year. And became a witness to history. Pray that may your life be free of hindrances. May your life be free from hindrance. What you wrote is really excellent and I thank you for that. Sister. Thank you for your courageous composition. I always wanted to have conversation with you in person. And I deeply respect you. The reality is, that they are they and we are we. I believe that one day we will live under our own sky of freedom. This is evident from their conduct. There is no place for dictatorship in this world. Sister Jamyang Kyi. Your courage and honour will remain in our hearts. Whatever they do, we can trust that they cannot diminish our courage. An external physical pain will give birth to countless courage. Your pain has planted seeds of courage in the hearts of students. We believe that it will remain for hundreds of years. I am a female student at Tibet Agricultrual University and I am studying environment sciences. 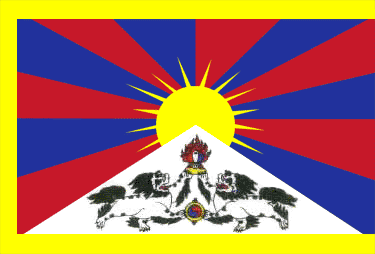 Although this land is called Tibet, there is not much value to Tibetan language. Therefore we have found Tungkar Cultural Centre in order to preserve and allow the Tibetan language to flourish. I hope we will get your support and hope to keep in touch. You suffered for the people of Tibet, how important it is to speak out the truth. Thank you for all your amazing translating work! What touching poetry to be found among the comments! Thank you for the translation. This is the first update I’ve seen on her status since the arrest.